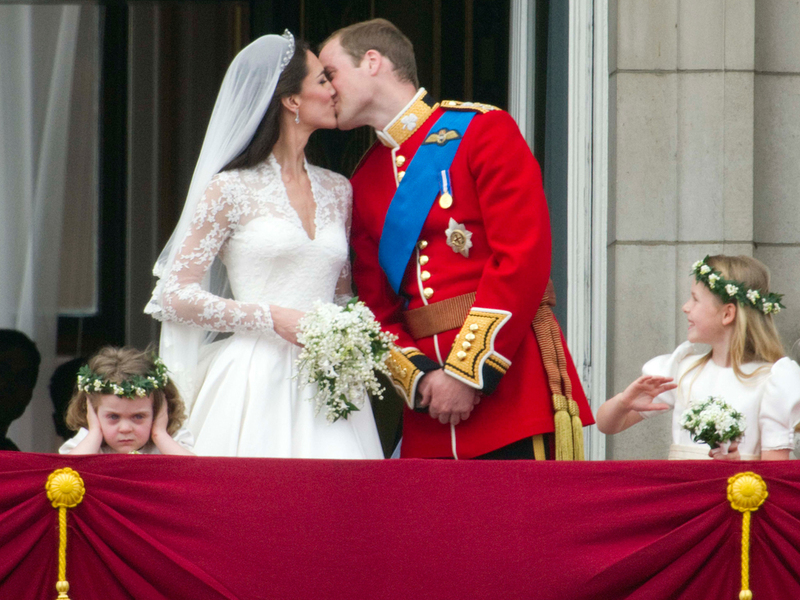 As Kate and Wills celebrate their three year wedding anniversary today, we're taking a romantic trip down memory lane to remember their magical nuptials. Kate Middleton and Prince William welcomed the world to their wedding day back in April 2011 tying the knot in front of an emotional nation, and as the couple celebrate their 3rd anniversary together today we couldn’t help but get a little nostalgic. Prince George may have been holding our attention in recent weeks but to mark this romantic day we’re popping him to once side to reminisce over the beautiful event itself. Still, three springs later, we’re gasping over Kate’s gorgeous lace dress by Sarah Burton at Alexander McQueen, cooing over their first kiss as husband and wife and celebrating the most grandiose British nuptials of the century. So, what are our most memorable moments of the majestic royal wedding? Besides trying to get a hotspot on the road up to London’s Westminster Abbey to capture a glimpse of the dress in action, the frock itself made a serious fashion mark on us. Sweeping down the aisle in a flurry of white embroidery, the Duchess of Cambridge looked simply stunning as she approached the alter in the bespoke designer dress. With her hair draped back into a half updo, complete with royal tiara and dropped diamond earrings, she really was a sight to behold. Then came Wills, strapping and handsome in his Irish Guards officer’s uniform, gazing at his bride with loving eyes. Not forgetting to mention Harry’s equally suave outfit and Pippa’s now-famous behind thanks to that dress. From the sulking royal tot in their famous family snapshot on the balcony to the cars, guests, outfits and speeches, we’re welling up just thinking about it again.